You can use your Google account to log in to LiveChat. This will save you the need to remember yet another password and will allow you to easily access your LiveChat. 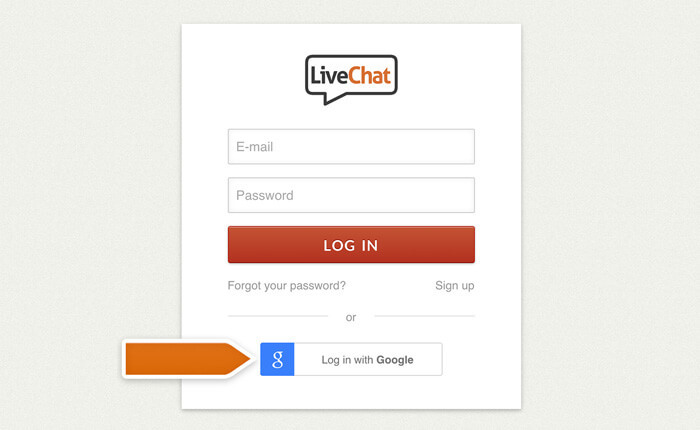 To log in using a Google account, simply click on the Log in with Google button when signing in to LiveChat. Next, choose the account you want to use to proceed. You need to use the same account you used to create your agent account. To increase the security of your LiveChat, you can use Google’s 2-step verification. By making logging in with a Google account mandatory, your agents will need to enter a security code when logging in. Check out our tutorial for 2-step verification to learn more.